Australia has a number of interesting destinations, sites, beaches in Australia and a unique culture that should be explored. Popular places in Australia to visit range from the islands that are found near the mainland Australia to the desert area known for its bushes, trees, and wilderness. Australia is home to a number of exotic animal and bird species and therefore it is not surprising to see such a huge number of national parks in Australia. Australia's coastline is home to a great number of beaches and bays that offer some of the best water sporting facilities. Perth has a range of attractions and activities to enjoy from sight-seeing, wildlife up close, Aboriginal culture and dance, to aquatic fun and adventure. It is one of the most popular place to visit in Australia. Attractions and places to visit in Perth, Australia in the Perth include King's Park, Perth Zoo, the Perth Mint, Stirling Gardens, Lake Monger, the Art Gallery of Western Australia, Western Australian Museum, Concert Hall, Cultural Centre, His Majestys Theatre and the Institute of Contemporary Arts., Burswood Casino. Adelaide is the capital and most populous city of the Australian state of South Australia, and is the fifth-largest city in Australia. Adelaide is a thriving city that includes some of the most prestigious vineyards in the country. There are a number of places around the city that are ideal for getting away from it all for a few days, as well as enjoying a night life that is low key but very active. Close to Adelaide are the Adelaide Hills with national parks and reserves. To the west is Adelaide 's coastline with beaches and seaside suburbs. Tasmania has long been considered one of the most popular places to visit in Australia. It is the place where you go to escape the rat race of over populated cities, the place where nature and wilderness meets, and the place where convict history and Tasmanian culture come together to form a rich and diverse story. Tasmania offers breathtaking scenery, hiking and camping. Nice cities with excellent infra structure to visitors. The nature is the highlight, with spectacular beaches. Here is the world renowned Opera House. Destinations such as the Hunter Valley Wineries, Blue Mount ains or Sydney dinner cruise through the famous harbor are very affordable. Other Places in Sydney, Australia to visit include the Harbour Highlights Cruise, Jenolan Caves, and the Outback Snapshot. Don't forget to stop at the marine aquarium at Darling Harbor to be absolutely amazed with their large collection of marine wildlife. Cairns is the main entry point and from there you can travel north or south and out to beautiful island resorts. Luxury holiday homes are a great accommodation option in this part of Australia. Home to colorful marine life the Great Barrier Reef, located in Cairns, Queensland's most northerly city is one of the natural wonders of the world. The Great Barrier Reef is known as the world's largest coral reef. Listed as a World Heritage Site, the Great Barrier Reef is a premier holiday destination in Australia. Many varieties of fish and other forms of sea life make the Reef home, and there are plenty of opportunities to learn about and observe. Enjoy the view from the Great Ocean Road. Running for over two hundred miles along the coastline in the area of Victoria, the view is breathtaking any time of the year. There are plenty of interesting local restaurants to try along the way, as well as several great places to stop and enjoy a beer. Fraser Island is the world's largest sand island. Once a major immigrant and industrial port encompassing much of the area now marketed by tourism authorities as the Fraser Coast, the island is a growing hub for eco tourism. The unique sand dunes system, the rainforests on sand and the beautiful fresh water Lakes all add charm to the allure of the Fraser Island making it a hot holiday destination for people all over the world. Gold Coast is major attraction for surfers and beach lovers. One of the most beautiful National Parks in Australia with plenty of wild life and variety of native plants. The Kakadu National Park is a natural marvel encompassing a variety of habitats, a mass of wildlife and significant rock-art sites. It is home to great colonies of kangaroos and koalas. Located near the town of Townsville, Queensland, and the Great Barrier Reef, Magnetic Island is famous for its great beaches. Consisting of mineral rich sandstone, Uluru measures 2.4km (1.5 miles) long and 1.6km (1 mile) wide, and is one of earth's great natural wonders. Also known as the Ayers Rock, resting in the middle of the Australian continent lies the imposing monolithic sandstone structure of the Uluru, a major tourist attraction of the region. Uluru is considered to be an ideal activity at sunrise and sunset, when the range of colors across the red rock seems to waver and change in fascinating patterns. There is so much to see and do in this amazing country. Hope this guide on most popular places to visit in Australia, will be helpful in planning your Australia Trip. Australia has something for just about everyone. From simple holidays to culture filled excitement, there are all sorts of options to enjoy. Thanks for this useful information on top places to Visit in Australia. These all are best places to visit in Australia but my favorite is Adelaide. 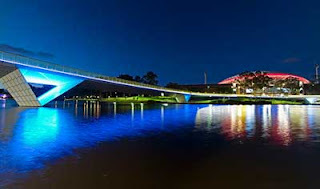 It is one of the best and successful cities with lots of attractions as well as yummy restaurants with entertainment activities; although Adelaide is that city where kind of kangaroos found in wild life places. No doubt these all are best tourist attractions in Australia. IMO, Sydney is pretty good destinations where plenty of outstanding places are located especially Harbour Bridge which is one of the Australia's most well known landmarks. Whenever I visit there so my first priority will be this wonderful place. Thanks for sharing. These are the best ones but i think you forgot Whitsunday Islands - that are wonder of Australia.